NEED A QUICK HEALTHY BREAKFAST? We get asked a lot “what do you two do for breakfast?” Well to answer that depends on the day, our schedules etc. Most of the time we will do eggs of some sort whether in an omelette or poached over a bed of greens. However we do enjoy a protein-packed smoothie on occasion and now that summer is around the corner,they are becoming more frequent!There are many types of proteins in the marketplace. Most of us are familiar with the big plastic containers that claim to add muscle, help you to lose weight and of course taste great. Unfortunately most protein powders on the market are made with cheap ingredients, have chemicals and flavoring agents and are allergenic. Even the “natural” proteins that you find at many health foods stores have high amounts of processed sugar to make the protein powders taste better. The particular protein we recommend is Epic Protein. 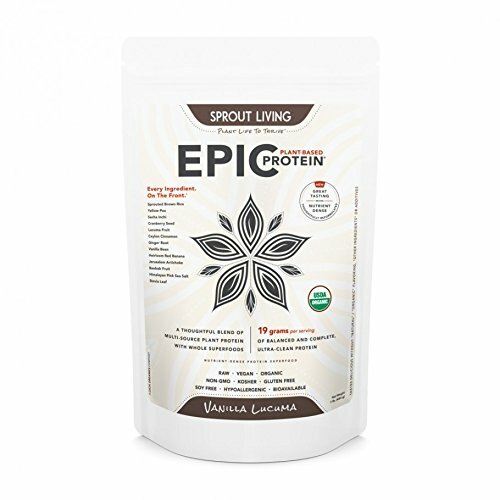 Epic Protein uses a patent pending process of sprouting and fermenting the whole grain brown rice and pea protein. This unique process increases digestibility and protein content. Plus it’s naturally sweetened with plant superfoods! What’s in it? Creamy texture, rich real flavor and full-bodied sweetness with no ‘fake’ aftertaste. Nutrient-rich superfood blend including exotic lucuma fruit and delicious vanilla bean. 3. VEGAN – Many Vegetarians and Vegans find it difficult to get enough protein in their diets. Epic Protein is a convenient and delicious way to incorporate more protein into their diets. 4. GLUTEN-FREE – For those people who are gluten intolerant or trying to avoid gluten in their diet Epic Protein is certified Gluten-Free. 5. NON-GMO – We all know the dangers of Genetically Modified Foods and we at Organic Housewives make sure that all of the foods or snacks we offer are NON-GMO. The process creates a complete protein made up of 8 essential amino acids and other non-essential amino acids in a perfectly balanced amino acid profile. It also contains the three Branched Chain Amino Acids which are essential as they are not synthesized by the body. They must be ingested through specific foods that are rich in these amino acids or taken through supplementation. Epic Protein delivers 19 grams of protein in one serving with zero fat and sodium. Epic Protein comes in Chocolate Maca, Vanilla Lucuma and Original. It is very common for those interested in athletics to make the claim that a plant-based protein simply cannot assist in muscle growth or recovery in the same way as an animal derived protein (like whey). In fact, many bodybuilders who have changed from whey to a plant based protein have noted that the muscle built from plant-based protein is more solid, very dense and much longer lasting. So if you are looking for a quick breakfast that is portable, full of flavor and will keep you full look no further! Below is one of our favorite smoothie recipes. Experiment and have fun! 1 stevia packet or 2 teaspoons of honey to taste. Put into a blender and enjoy! 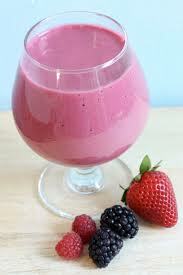 Have a great day and beat the heat with a Berry Smoothie!